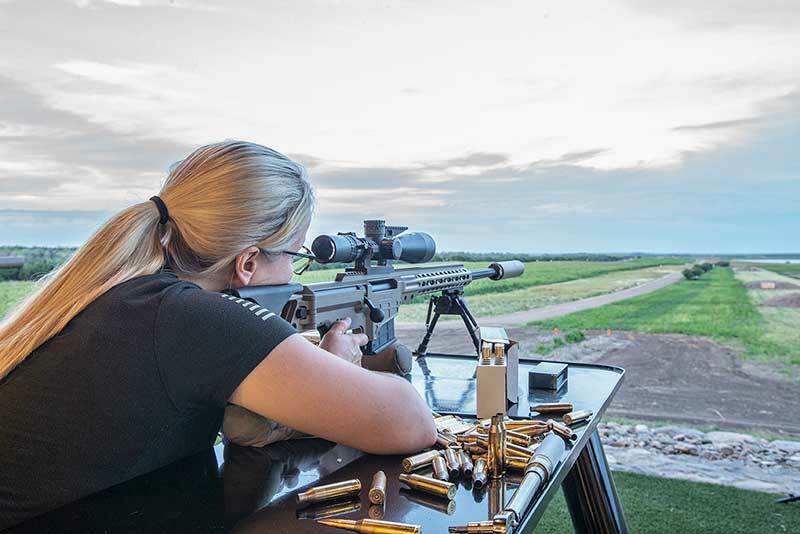 You have arrived on the South Dakota prairie and find yourself one of those fortunate enough to experience luxury long-range shooting at The Range at Paul Nelson Farm. This is not your typical day; this is a day filled with genuine camaradarie, elite training and unrivaled long-range shooting at its finest. You can expect the best as we work to turn your long-range shooting experience into memories of a lifetime. In preparation, we have detailed a typical day at The Range at Paul Nelson Farm. As with all guests, our top priority is your complete satisfaction, thus if you have additional desires for your group, please let us know. For the early riser up at the crack of dawn, there are countless places around Paul Nelson Farm to peacefully watch the morning come to life. Our sunrise and the sounds of the farm will jump-start your senses and your energy for the day ahead. If you choose, you may catch the morning news in one of our many entertainment areas, enjoy a workout in our executive fitness facility or take an early-morning retreat outdoors soaking up the sights and sounds of the endless South Dakota prairie. Continental breakfast will be awaiting you in the Main Lodge. Help yourself to muffins, toast, bagels, cereal, yogurt and fruit. Or simply grab a cup of fresh hot coffee and relax by the fireplace, get some business done in a conference room, or escape to the library as you anticipate the day ahead. By the time 9am hits, continental breakfast has now been replaced by a fresh hot breakfast served in the Main Lodge. Whether it is piping hot homemade biscuits and gravy, farm-fresh eggs, sausage patties, pancakes or stone-cut oatmeal, there is surely something your stomach will crave. Grits, various bread selections, fresh fruits and juices are also available in addition to premium coffee. Join your group at your private table and enjoy the food and friendship as you anticipate your day ahead. After consuming your fill of a bountiful breakfast, it’s time to prepare for The Range. As you adjust your attire for the weather, relax while envisioning the perfect shots ahead. If you need any additional apparel, now is the time to check out the top hunting and shooting brands in our Pro Shop. As your group assembles to head for The Range, our new 6-passenger carts will arrive to shuttle you the 200 yard distance to The Range and our elite training staff. The time is now; your memorable long-range shooting experience is underway. The Morning Session: Rifle, scope, ballistics…and shooting. As you organize at The Range, settle in for some initial teaching from our elite training staff. Whether novice or experienced, these decorated professionals will educate you on key aspects of our custom rifles including set-up and scope adjustments. From there, we transition to the basic of ballistic training where you will gain a solid understanding of bullets, velocity, trajectory, distance and wind including proper adjustments. This classroom environment is designed for fast learning with initial time from study to shooting approximately 90-minutes. Next we move to the open range doors to discuss communication between shooter and spotter, learn to use the range finder, and discuss body position and prep for our initial shots. This 30-minute session will create a create bond between partners as you realize together you are the team, relying on each other for success. Finally, the moment you’ve been waiting for has arrived; your initial entry into extreme long-range shooting. Using the morning learnings as well as additional instructor guidance, it is time to to hit targets from 100-600 yards. This is your life for the rest of the morning; shooting, refining, perfecting and becoming more advanced in long-range shooting. Following your successful morning at The Range, there’s no doubt you’ve worked up an appetite. Your group will be treated to a delicious lunch back at the Main Lodge. On any given day, choices include homemade fried chicken, beef brisket, chili, homemade soups, beef stew, Jessie’s famous meat loaf, grilled chicken sandwich, sliced turkey, and homemade desserts. Mmm! Mmm! Wonder what’s for lunch today? This time is set aside for our guests to catch up on any of life’s demands not left behind, do some quick bass fishing in Paul’s Pond, try some sporting clays if desired or simply relax in your private room or one of our many executive lounges outfitted with plush couches, HD television and high-speed WiFi. It is not unusual to find yourself already reveling about the best shots of the morning in anticipation for the afternoon ahead. And, if the morning shoot has you fired up, the afternoon will take you to a whole new level as you reach for that 1-mile shot. After being well fed and a brief recovery, it’s time for an unforgettable experience and unrivaled afternoon of extreme long-range shooting across our vast array of targets. Load up for your 3-minute cart over to The Range. We will pick up right where we left off. The next 3 hours will be unforgettable; filled with much shooting, continuous learning, and gained experience. The time will pass with incredible speed as we increase distances from the morning 100-600 yard, through 600-1,000 yards and on to 1,000-1,500 yards capping off with a 1-mile shot. You will absolutely develop a close tie with your partner, as shooter and spotter work as one hitting numerous targets and varied distances and wind factors. As your skill continues to improve and your training advances, our elite instructors will press you with challenges to test your learned knowledge enabling you to see your own development in action. You are now very comfortable shooting and spotting various distances, you understand wind and can adjust for it, and you can set your body up for successful shot positions. It is time for you to take aim 1-mile ahead. Extreme long-range shooting shared with friends and creating lifelong memories; this is The Range experience at Paul Nelson Farm. Great conversation will be in full gear and memorable moments will be shared. Relive the events of the day in front of the fireplace, by one of our outdoor fire pits or the balcony of one of our lodges watching an amazing South Dakota sunset. Hot hors d’ouvres will be served for your group’s enjoyment including jumbo shrimp, specialty dips and pheasant prepared in a showcase of ways. Cocktails are available at each of our eight fully stocked bars, and it is likely a sporting event will be playing on the TVs. This is where relationships are strengthened. As if the day of team-shooting did not build bonds, nothing can bring a group together like Dinner – truly a time to enjoy your group at their own table. Whether the evening menu is mouth-watering Prime steaks, thick cut pork chops, pheasant & wild rice, or our specialty – Paul’s prime rib, we are certain this will be a time to celebrate and remember the day and the people together. 90+ point bottles of wine, premium homemade meals, friendly conversation, a tasty dessert, and an after-dinner drink will make for a memorable feast. And on that lucky evening, the sound of Cheryl on the harp will bring the room to life with an ambiance unsurpassed at Paul Nelson Farm. By this time of the day, most of our guests are looking for a comfortable chair in front of the fireplace, watching a game on the movie theater screen, socializing with table shuffleboard and drinks in one of our lounges or sharing another memory while enjoying a glass of wine, a fine cigar or other indulgence in one of our many custom areas… could there be a better way to end a day with close friends and associates? For those extending the night before retiring for the evening, there are many options to continue the day as well. After a quick call home to family, you can challenge a friend to a game of pool, relax in the massage chairs, hit the whirlpool and steam room, prove why you deserve the title of “Poker Shark” or check out the Taylor guitar or piano and remember how music kindles your soul. And when you have finally reached the end of your day, slumber in to your own private room. Your plush bed and linens will help provide a quiet night on the prairie with un-interrupted sleep finding you rejuvenated in the morning with the fact that you get to do it all again; even better! Ready to plan your Extreme Long Range retreat?